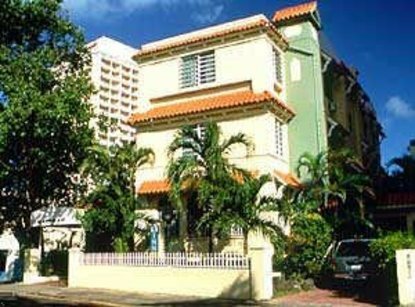 El Canario Inn, San Juan's most historic Bed & Breakfast inn, is centrally located within a short block walk to famous Condaddo Beach in the heart of Condado, San Juan's main tourist area, ideally situated between the International Airport and Old San Juan historic city and cruise ship piers. A short block or two away, one will find a wide slection of shops and boutiques, the area's finest dinning and fast food outlets, live music and entertainment, a spa, fitness center and an internet cafe. Our location is perfect for holiday and business travlers alike. Easy access to Old San Juan and Plaza Las Americas by public bus for 25-50 cents. Watersports, golf or tours to El Yunque Rain Forest, Rio Camuy Caverns and Ponce are easily arranged through our freindly, couteous, bilingual front desk staff. All air-conditioned guest rooms have a Bermuda ceiling fan, private bathroom, color/cable TV, direct dial telephone and in room safe. Complimentary tropical continental breakfast and morning paper served daily on our interior tropical filled patios. Our front desk is open 24/7 so even if you are arriving late, we'll be there to greet and welcome you to our beautiful island. **Note - Credit card required at booking, but is not charged unless you cancel late or fail to show for room as confirmed. Hotel will request the card again at check-in for room charges or you may pay in US cash or Travelers Cheques. Note card holders name if different from the guest.